I get a lot of questions on this rug. Here's where I got it. My house is quite open so there's no way to just shut the door to the living room or kitchen or dining room. When you come into the front door, you pretty much see everything....front room, stairs, hall, living room...walk a little bit further...dining room and kitchen. So, these little tips apply to a semi-'contained chaos' home. If you have a huge mess on your hands, you'll probably need more time. I like it when I get the 1 hour visitors, it gives me a little more time but still...1 hour?...especially when your house is in massive chaos and your dishes are piled so dang high you can't see the window?? You can't get too much done in that amount of time, especially deep cleaning. I'm going to be very vulnerable here and show my deepest darkest secrets of my messy house...so don't judge :)..this is actually pretty contained compared to how it usually gets. To this.... in 20 or so minutes. Storage containers are your best friend. Contain clutter in cute storage baskets, bins or other containers. For the baskets that over flow, just throw a cute blanket on top of them, then you can't see the clutter inside and it actually looks like its just a place to store you blankets which is totally stylish :) ...aka barbies with no heads sticking out of the basket are not. These are also great to corral movies, books, magazines, remotes, mail, randomness....etc. Click here for some cute ideas for storage baskets. 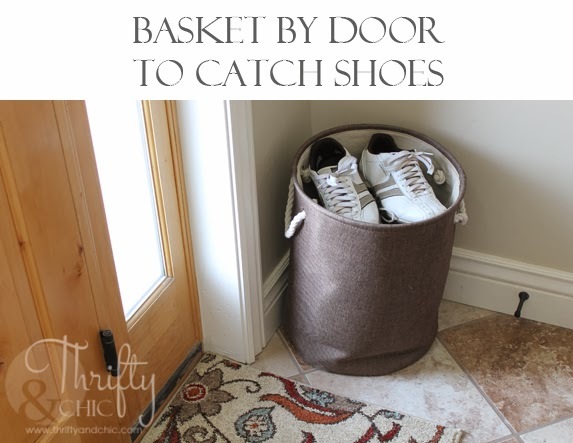 Hide shoes in a cute basket/bin behind the door. If it has a lid, even better! My updated storage for shoes is cube storage. Love it! I like to hide toys behind the couch. I love my sectional because it offers this whole 'out of site' cleaning. Where it looks clean cuz you can't see it even though its there. Here's another idea of outside storage behind the couch. 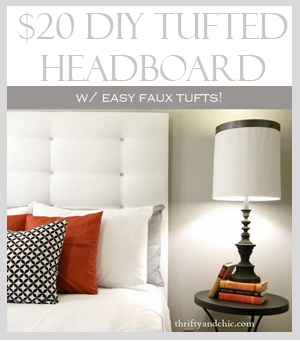 Create a cute window seat! While we are on the kitchen, clean the fridge and make it free from magnets and mess. Throw them in the box on the counter if need be for the moment. Or put them all on the side of the fridge that no one will see. Hide things under the couch if need be. Yes, I do this. But not like with trash or anything, only my laptop and cords. I usually have them out somewhere and its just super quick to hide them under the couch than to take them back up to my office. Pick up obvious clutter. Toys. Trash. Dishes. This will probably be like 50% of what you do and make a 90% difference. Sweep and don't mop unless you have obvious dirty spots. Then just spot mop. Or...if you are like me...I rarely even sweep in these cases since I have wonderful tile that completely hides all dirt and dog hair. 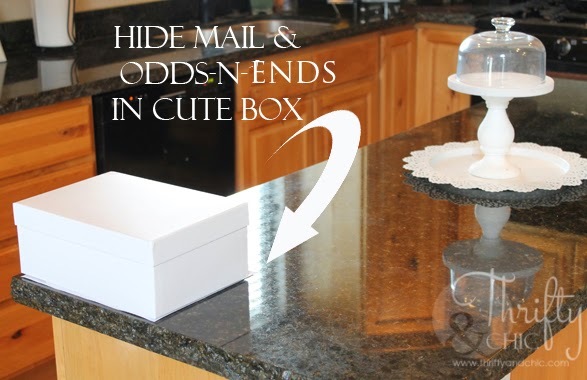 Make sure the counters and tabletops are clutter free. Wipe them down quickly. Dust. Someone can always spot dust especially on dark surfaces. It's quick to just get a duster or swiffer and go over tabletops. 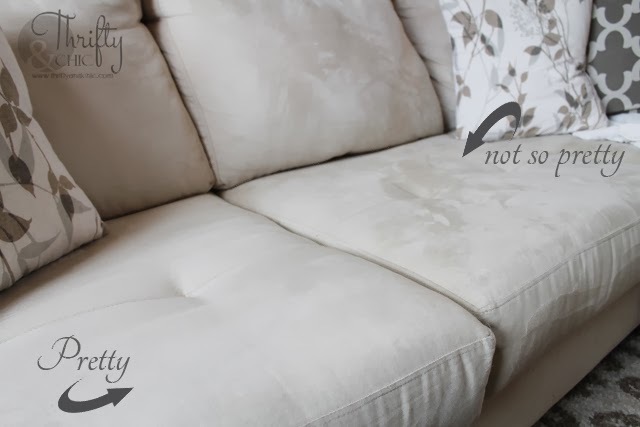 If you have a microfiber couch, do this simple trick to pretty much clean anything off of it...like dirty little finger prints, random food debris that has been stuck on. This won't do much for liquid spills but you might as well try while your at it and see what it ends up looking like. Just take a brush and scrub the heck out of the spots. Then make the fiber go all in the same direction after you are done scrubbing, use your hand to do this or the brush. If it's day outside, open the curtains and let the sun shine in. Makes for a brighter, cleaner looking space. If you need to turn down the blinds, turn them up! 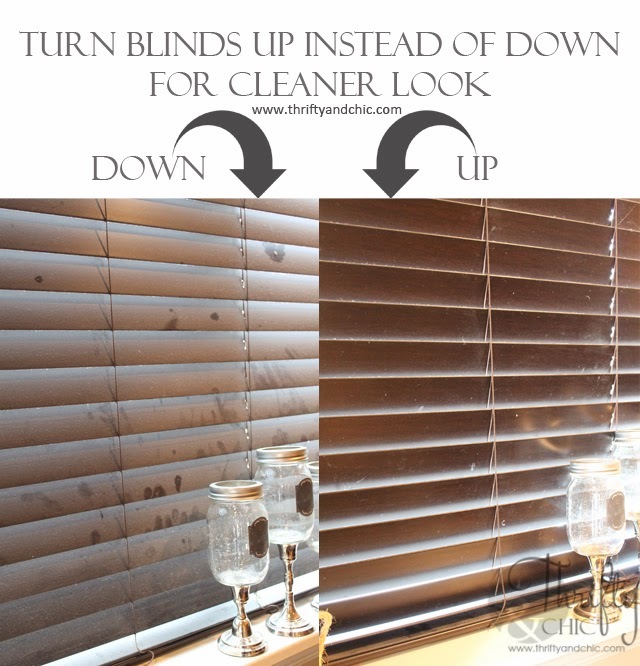 The bottom side of the blinds don't attract as much dust and grime, so when you turn them up, the bottom sides show rather than the nasty top part. I had NO idea the tops of these were this bad lol. Shows how much I turned these up, I never ever see the tops at all. Maybe it's that time of year decade to clean them. Straighten the chairs in the dining room. 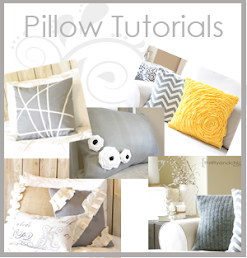 Straighten the pillows and throws. Straighten the rug. Yes, I don't understand how my rug that is on carpet moves constantly. But it does. So this sadly is one thing I always have to do and it drives me mad. Straighten up books and magazines. I've noticed that for the most part, people don't use the bathroom when they come over for an hour or so, but you never ...ever...want to leave that to chance if your bathroom is a mess :) So, if it is, hide the mess in the cabinet. Throw away trash. Scrub the toilet quickly, not forgetting to pick up the lid and clean under there. Wipe down the sink, faucet and mirror. Pick up obvious debris left on the floor. 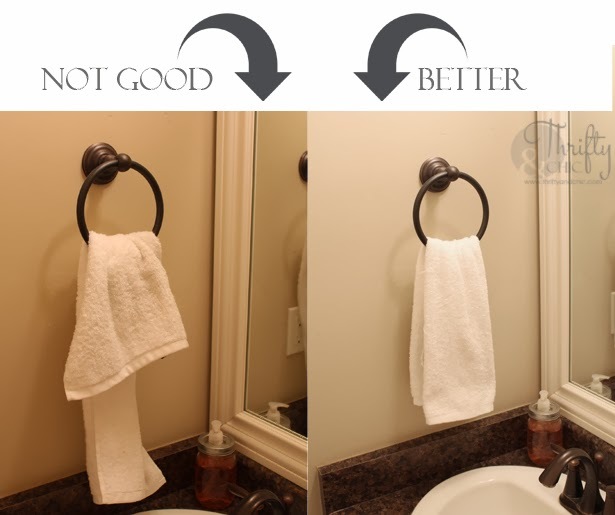 Be sure to straighten the bathroom towel also and flip it over -that side is always cleaner. love this post! LOL! Thanks for telling us what it's really like-cause we all do this! Your post made me feel really good!! It's nice knowing I am not alone faking a clean house! And here too, in 10 minutes the mess is back! You just can't work at home, take care of the kids and have a Nice clean house for real, well at least I can't...So Thank you, now reading your post, I dont feel So guilty! I don't think most people can so don't feel guilty :) At least we are in the same boat! Loved this so much !!! I have gotten out of the habit of doing these things once my kids got older. But YOUNG ADULT CHILDREN are sometimes messier than they were as toddlers. So, this is a great reminder for myself and an article I can pass on to my girls and daughter-in-law. In a pinch I've been known to put dirty dishes in the oven. However you have to remember they are in there before you cook anything. I've melted a few ice trays during preheating! Glad to know I'm not the only one. And THAT is why, despite hating the stairs, I still don't want a single-level house. It's so much easier to carry a couple of buckets of crap up there and leave it! I have zero places to hide crap downstairs anyway. No storage in the powder room, a hall closet crammed with a vacuum and carpet steamer and the pantry (where the garbage can lives). That's it. So sweet to have posted this, and it makes me feel so much better. It's so hard to compare yourself to someone else's "highlight reel". What I mean is that I see all of these blogger homes who are spotless and beautifuly styled, and I can barely get my dishes done. Thanks for the back to reality post! Love all of your quick fixes! Thanks for being REAL! I love your home and your blog. By the way... I painted my kitchen cabinets last year (after spending about a year getting up my courage) and am SOOO happy with them. If you wish they were white, I am sure you'll love them once you paint them. You don't have to paint the insides - just the doors and the frames. It will look amazing! Just do the island and see how it comes out! White cabinets show dirt... just saying! So true! I painted my white cabinets a soft cream colour for that very reason. 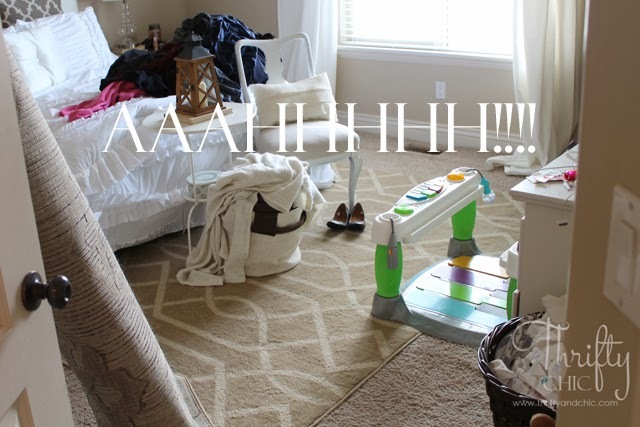 Oh, and if you think a little one is messy just wait 'til she is a teenager! I call my daughter "Hurricane Julia" because she leaves a trail of mess behind her. I can tell exactly what she has done by following this trail - she had a snack (dishes), she did homework (paper) she watched tv (nail polish). I wish I had read something like this 42 years ago. I married a man with 2 kids and we soon added an infant to the mess. 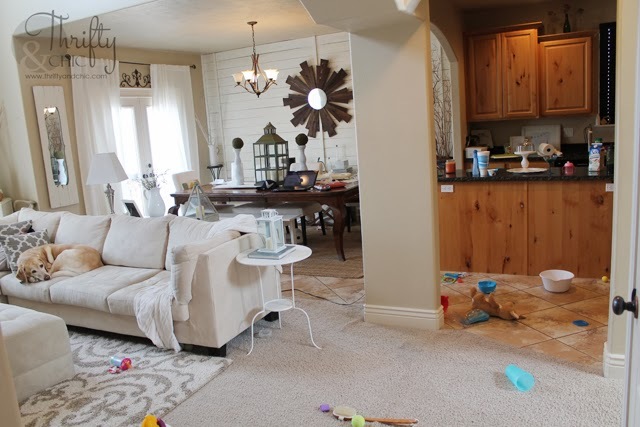 My house was always messy and I thought I was the only one who couldn't keep up. To top it off, my in-laws lived next door and were always dropping in. Even if I had a 20 minute warning I wouldn't know where to start because I had the mind set that everything had to be perfectly clean. Now that the kids are gone and I'm retired, I finally have the house in the shape I always dreamed it should be--most of the time. You said you wish you had white cabinets, but if you did white appliances and a light glass tile backsplash it would bring so much light into the kitchen! Just a suggestion :) loved this post! I have white cabinets, and five kids-there are always dirty fingerprints, smears, etc. on the doors? I long for wooden cabinets that would hide things better!! These are such great tips! I also use my bed room as the catch all. It seems as though people always want to come over when I'm doing laundry so I just put it in a laundry basket and put it on my bed. I have a mountain of clean laundry in my bathroom. MAYBE YOU COULD do a piece on organizing your bathroom laundry for those of us that don't take it upstairs, or somewhere else like we are supposed to. Find a good company that makes good mobile storage for such a thing. I know mine has been like this forever, but maybe some other options to make it look better downstairs is an idea?? You are the idea guru!!! Would like to see what you come up with!! I enjoyed this very much. I had this happen more times than I can count in 20 years of kids and 25 years of marriage. I also used the laundry room and bedrooms as hiding. The easiest thing I have always done is run around with a laundry basket and just put every single thing in it that needs to be picked up. Then grab another! and another if need be. The times that I absolutely couldn't get the dishes loaded I would throw a pretty dishtowel over the top of them. It sort of looked like it was drying there even though there was a pile underneath. A decorator once told me, if you can make the floor look clean then the house will look clean. So.. pick up and sweep of vac. Thanks for the tips!!! 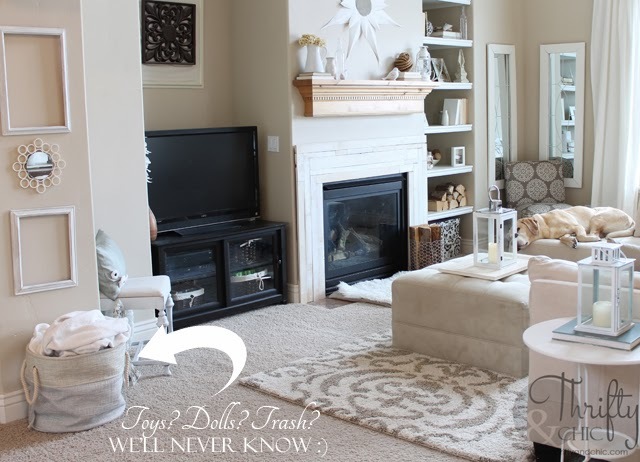 I like the idea of having a bin to throw things into and hide with a throw blanket!! lol. Oh dear. I guess that backfired :) I have also turned on the oven completely forgetting about the dishes in there. Luckily they were only pots and pans. Thank you for these tips! I have containers everywhere as well but never considered one by the door for shoes! I will need to change that ASAP! It will change your life :) No more crazy shoes strewn about! Perhaps you should just clean your damn house! go Alicia! some people that don't have full time job, kids, dogs wouldn't understand a DAMN bit. Infact, I challenge anonymous to DO what WE DO! 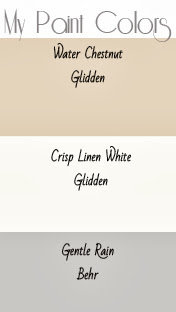 If you really hate your cabinets, by the way, how about whitewashing them with a transparent white? Sort of like pickling. I know...now all my friends and family will be coming over and checking all my hiding spots lol. My vacuum is always out and that is the first thing I do,vacuum quick(hardwood floors) clean off the table,counter,and I grab all the stuff and shove it in a box as well...bathrooms wait until the last,when the guest gets there..I "fake" gotta go pee and clean while I am in there...Love your ideas and sooo happy I am not the only one. Great tips. I've stored my "clutter" in clothes baskets behind a closed shower curtain many a times. If it's evening turn the lights down and light and candles, sconces and maybe one main lamp. A couple of denture tablets in the toilet and a quick swish will do the trick, too. Only dust as far up as the tallest guest. I keep a basket in the corner of the living room (or behind my hubby's recliner) where I can throw books, magazines, papers and junk and cover it with a folded throw. I love this article because I am trying to sell my house and have 2 kids, 2 dogs (1 being a puppy) and a husband. GOD HELP ME!!! I totally am running out of places to "hide" things hence the move.....nice to know I am not crazy! I have never been to your blog before but I FREAKING LOVE this post! Seriously best post ever! Your house is my dream home :) every bit of it is dreamy ! I LOVE how you decorate , Love Love Love ! I love your living room and dining room! I love your sectional and ottoman. Where did you buy it? You can also spray fFebreeze on cold light bulbs; when you turn the lamps on, everything smells great! Omg! I am so glad I'm not the only one that does this! It always makes me feel bad when I walk into people's houses and their sooo clean and organized and wonder what is wrong with me and my family! I can't keep my house clean for five minutes! So if I have someone coming over I pile all my clutter into my laundry room which is attached to my main floor,goes into the garage. I hide stuff on the side of my couch where no one can see it. Do the candle thing. And fake it. Ten of course after they leave I need to put things away so I can get to my garage! But it's just so nice to know that I'm not the only one! And yes, my husband springs people coming over at the last minute also! (Especially his parents coming to stay for a week). So your not alone there either kiddo! lol. Oh my goodness I would freak if my husband sprang visitors on me that were going to stay more than like 2 hours. The guest room is where I had half my stuff! Love your blog, it's so true that no one ever calls when you've just finished cleaning. Even if it's chilly out, I open a couple windows to get rid of the stale air. Then everything with fabric gets spritzed with freshener. :) Lovely to know this stuff is normal! I stack the dishwasher as we go through the day and put it on after dinner so that it is done when I get up in the morning. When I get up in the morning, I unstack it while waiting for the jug to boil and put the still damp plastics in the drainer, Everything else can usually go away. This empties it, ready for stacking throughout the day as the items are used. As I am cooking, I add what is finished with as I go. Then we eat, and stack straight after and on it goes. this means minimal dish problems. Just the occasional dish if it is created while running through the cycle. Even hubby and children are getting into the rhythm of it. Even "messy" I think your house is lovely!! Love your style!! I don't see why people are attacking this post. I'm a student, 3 weeks away from my due date, have 2 cats (who constantly shed and drag out toys), a turtle (ok, he's low maintenance), and a husband with a rotating work schedule (he works nights one week, days the next). On weeks where my husband works nights, I tend to save loud cleaning (vacuuming, washing laundry/putting it away, dish washer, cleaning our bathroom) until after he leaves for work around 5:30p... which, by that time, I'm already tired enough just from being awake since 6:30a. During the day I do my "quiet cleaning" - dusting, picking up kitty toys, picking up other junk that gets left out, wiping counters, folding laundry, trying to keep the cats from disrupting a sleeping hubby, grocery shopping/running errands, hand-washing plates/bowls/silverware (I save containers and pots/pans for the dishwasher) - our kitchen is a daily cleaning target, no matter what I do. All of that on top of homework and squeezing in a 45 minute walk at some point, plus time to rest for a while before I collapse from back pain. I can only imagine how difficult it will be once the baby's here and I start working again. I commend those of you with children, full time jobs, pets, husbands (we all know they can be just as messy as kids, admit it! ), and lives, and still manage to get dinner on the table and maintain a clean home (even if it is faked from time to time) without losing your sanity. I think these last-minute tips are great! I love you for being a true-blue normal human being. Awesome post! Thanks. I call this the Trash Stash Dash. Trash: no brainer how can a house even look clean with garbage around? Stash: get those embarrassing items out of sight first-- all underwear must be away--in the drawers or in the dirty laundry bin. I hand wash my "undermentionables" and hang them to dry. I always put them away for the T S D, even though they are not hung where guests go--strange things happen & people have ended up off the beaten path at our house--but they have never seen these items. Then stash the rest of the stuff. Dash: go as quick as you can! Speed wipe, dust, sweep & vacuum the most needed things first. Love the post! When my house still needs work and the door bell has rung--I smile, let them in & tell them that we live here and nothing in life is perfect. I can honestly say that I then enjoy the visit and forget the mess (mostly because I know the "undermentionables" are away). I forgot to say how I love that your dog calmly sleeps with all this going on. Maybe women should stop "freaking out" because someone is coming over in 20 minutes and see the truth. The TRUTH is, people, INCLUDING WOMEN, have no idea what scale to place your house. So if you clean it? A overly concerned "friend" STILL will find fault if the couches are not as they like, or the colors are off, or if the walls need painting, or if you have more dust than they do, or if you have cats and they like dogs or you have dogs and they keep theirs locked away from company, or they hate pets all together....IN OTHER WORDS, A PERSON COMING TO YOUR HOUSE IS THERE FORE YOU, not your house..I know that is next to impossible for women to see through, but ESPECIALLY A MAN, we may have jobs that take us into other people's homes...so we see things that make us feel OUR homes are GREAT. And we see other homes that are squeeky clean COMPARED TO OURS (and that is the catch). Listen...BE HAPPY.HAPPY you have friends that like YOU and want to come over to see YOU..As far as YOU know, their houses are far worse than yours and they could NEVER be as clean as you, and now youre making them feel very very uncomfortable. ( I certainly have felt uncomfortable in some people SUPER CLEAN homes. I feel I have to sit gently on their couch and not wiggle much. I feel I have to tip toe on their carpet so as not to leave foot prints, I feel that I have to have Perfectly white sox now, because they have a house where they have made everyone take off their shows because they went out and got white carpet! If you are a woman in sandles, but need a pedi, NOW you feel funny. OR we relax and enjoy one anothers company. Stop freaking out. How about that? Wow... Chill out. I think we can all agree we would like for our home to look "together", especially when someone is visiting. I'm much more comfortable in a nice & tidy home, than a dirty/messy house. This is a light-hearted post that you are taking WAY too serious. Obviously you have some esteem issues you might want to work on. Rock on Alicia!! I like your post and I have to say its just me working full time with 2 large dogs and a cat inside and my place stays messy so I'm glad you are showing some quick tips. I think you need to remind people if they don't have something nice to say then to not say anything. Also I worried about painting my cabinets but the more I saw pics of painted cabinets the more I wanted it. I went with light gray (secret passage) but my mom thought I should go white but I knew with 2 dogs white would be impossible for me to keep clean and I love my gray cabinets now. Honestly I don't fake anything. We all have messy homes. (As a landlord I've seen a lot of people's homes without them feeling obligated to impress... That gave me more perspective) If you relax so will your friends. We're all better off for it. Now I do find a clean toilet important and no dirty underwear and bras visible in the bathroom. And my bedroom is a no dumping ground. It's scared to me. I've had friends say why is your only clean room your bedroom. Lol. And I say why is your bedroom stacked to the ceiling. No judgement and you have a beautiful home. We just have a difference in opinion on this. I know how you feel about getting up the courage to paint your cabinets, but try to look at it this way...How "Nice" are your cabinets if YOU'RE not enjoying them. I can tell that you would love and enjoy your kitchen so much more if it were more in line with your style...isn't that what your home is all about?! Go for it! Isso foi muito engraçado e útil! I greatly appreciate any wife and mother that doesn't pretend her house is perfect 24/7. Then there are the ones that clean their home constantly. Sorry..no can do. I live with 5 kids, two cats and a hubby. All who are messy beyond and despite what I taught them..lol. Life is challenging and we're all so busy these days. I'm hugging 50 and having a perfect looking home isn't as important to me as it was in my twenties. Being present with my family takes priority. I will say though, that in a pinch, I have 6 other people that pitch in so it gets done pretty fast around here! Another tip: I've been known to shove dirty pots, pans, and baking sheets into the oven to save time. My friend's mom actually put her dirty dishes in the trunk of her car once. She drove around with them there for a month!!! Love that I'm not the only one who tries deceiving people into believing I'm more productive than I really am or could dream of being. My almost 2yr old has been nicknamed "Tornado Girl." The totally randomness of where she puts things when she wrecks the house is like finding a bike in a tree. Lol. I've honestly given up trying to keep up with her mess all day long. If I clean a room she's in another room causing havoc. I've tried having her help clean with me & that becomes so stressful for both of us its not worth it yet. Here is a trick I use for the fast clean ups that helps me go even faster without the exhausting back & forth trips. Since we toss stuff into a room to clean later why not have a catch all basket/box/tote to throw things that are out of place into, to take everything all at once. I drag the basket & a trash bag along with me & gather everything up. Sometimes if I don't feel like dragging the basket I'll have a trash bag & throw all the odd things into a pile in the middle of the room. If I have a random towel or blanket in the room that doesn't belong I'll throw my pile on top & carry the whole pile out inside the towel/blanket. 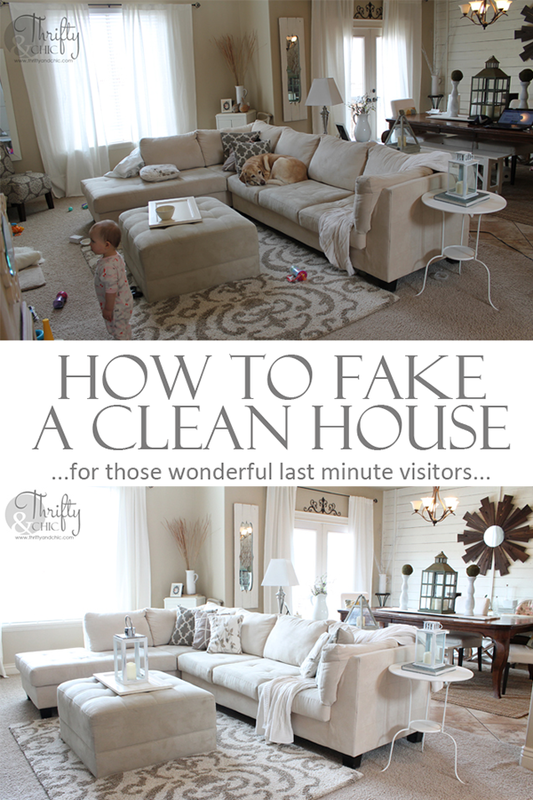 I honestly use this method to clean even when I'm not in a rush because its easier to take a basket & drop the dishes that my daughter played with in the kitchen & the clothes in the laundry room, the toys to the playroom (that never seems to be played in), blankets to bedrooms, etc. My trash is bagged & ready to go into the dumpster outside or in the trashcan in the kitchen if its not much or I want to send both trash bags out at the same time. 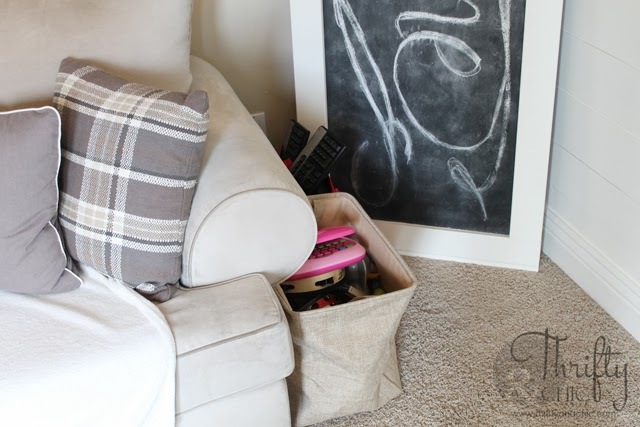 One more trick that helps save time is keep a basket in the rooms that get messed up most to toss random things in during the day to be put away when the basket gets full, at the end of the day, or when surprise guests are coming. I hope these tricks help speed up the "speed" clean, "fake" clean, & "everyday" clean. I love your home style and thanks for the great info! As for the bathroom smells, check out poopourri.com-it truly works. Thanks again! 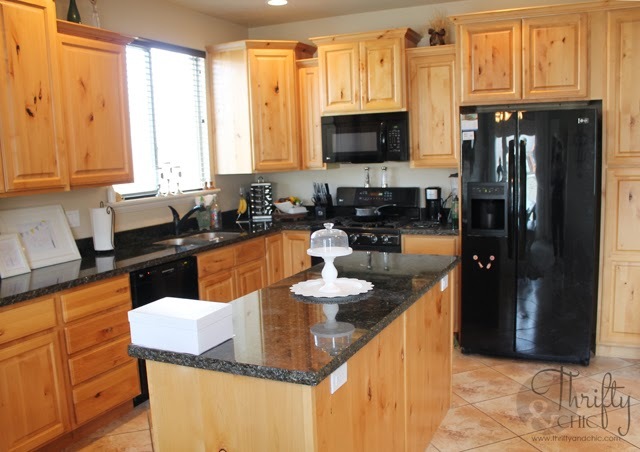 Your cabinets would look awesome in white!! DO IT!! You will love it. It's only wood! What a fun post! Glad to know I am not alone! And..paint your cabinets! Our's went from brown to white the first week we moved in, and I won't ever regret it, even if it is more work to keep them clean. They look so much better! I do this too! My husband calls it a tornado clean and ha no clue how I really do it, as he can't focus enough to really get it all done. I don't think he's ever figured out that I am mostly just hiding things in weird places. Which does mean we lose stuff every time I clean. However, now since I am pregnant and nesting, it is time for a purge!! What a great post! My Mom taught me how to do this years ago, when my Grandmother would randomly call and let us know she'd be coming by in 20 minutes. We knew what pieces of furniture were tall enough to hide our books under (Gram hated anything non-fiction & that was almost all we enjoyed), we hid dishes in the oven or microwave (after a melting incident in the oven), and once, my Mom put a couple of handfuls of silverware into a pillowcase, tied the end closed, and hid it in the washing machine (we didn't have a dishwasher)! The next day, we ran a load of whites, forgetting the silverware was in there. One fork came out kinda mangled and a knife was a little dented before we caught on to the noise, but other than that, they were fine. We no longer let things get THAT out of control, but I still like to tease my Mother about her crazy 'cleaning' methods. There is no way you could do everything you outlined in twenty minutes. Not possible. Oh and there is NOTHING wrong with tidying before people come over. I view it as a sign of respect to your guest. I hope you didn't move the dog! He has priority (to me). Your home is wonderful. My son & daughter-in-law have 3 children, aged 6 and under; their home is topsy-turvy all the time, even if they have company...so big congrats to you on this home-improvement done your way. I don't have a dishwasher, so I have hidden dishes in the oven. Also, my grandmother told me to leave the vacuum out. And when guests surprise you, you say.. "Oh my, I was just going to vacuum." A few times, I have tossed any and all into a trash bag and left it outside. lol! Love this post!! This is definitely going on in my house with 3 kids! Question off topic: what color are your walls!!! I love it!!! Thanks! This post was AWESOME! I was laughing so hard that my eyes started watering. I've used many of your techniques in the past, but I loved how you worded it. The arrow/picture diagrams just made it all the more enjoyable to read. Great job making us all feel like we are not alone in the world of little kids and constant clutter. This is a brilliant idea! I absolutely love this! I am going to utilize these ideas! Beautiful home! Ah! I love that rug in your living room! Where's it from? Wow!! I love this post. It is so real. Don't just love those popover visitors. I make a big mess all by myself. Love this. :) So helpful. So real! I have hid things in the oven only to preheat it at a later time & wonder "what's that smell?" for a second before alarm bells go off in my head & I go sprinting. I'm big on running heaps of stuff to rooms with shut doors. Short notice company usually means misplaced papers or bills - so I really like the empty box idea! I have done this quite often! The stuff goes to the laundry room, I usually grab a shopping bag , plastic ones, fill it , take it to the bedroom! My daughter always laughs and calls me ghetto cleaning! Lol. You should see her room, ugh! I just shut the door! I know one day she'll do all the things I made her do. Thank God I have a second floor, and basement! When trying to sell my house years ago I remember getting those calls from realtors saying they're bringing someone over in 20 minutes or so. Another good hiding spot that no one has mentioned is the clothes hamper (with lid, preferably). Lots of stuff fits in there and no one will look as they will with closets and cabinets. Great tips! I would add one: rather than flipping your towels, change them for new ones. I have bathroom with very bad ventilation and my towels don't dry very well. So even if I placed new ones a day or two ago and I know they are pretty clean, I can never be sure if they smell fresh. And the last thing I want when we have company is to worry that when someone will wash they hands my towels will leave them smell badly. This is awesome, thank you for sharing your vunerability & giving us good tips& a laugh. I like you logic! Oh my there are a lot of auto correct mishaps in my above post! I apologize! Something more on the grey side of course. Lol good heavens! All great ideas! I will add a suggestion from a friend re stashing items in another room. She suggested unscrewing the light bulb in that room. That way, if your company were so RUDE (lol) as to open the door, when they turned on the light, they still wouldn't see anything. She was hysterical and a master at cleaning subterfuge. Your house is gorgeous, even when it's messy! So beautiful...and stunning when it's all cleaned up! ..... makes me want to redo mine... but with two cats, two BLACK dogs, and three children perhaps white and taupe is not the best color combo for now...! great ideas though... I love the stash and dash approach! :D I have a Handy Hallway Closet that is the recipient of most of my clutter!! WOW, that one about the "spell caster" is truly frightening! Do you realize that person, that "caster," is permitting demons to work through him??? They're most definitely real, as is their master, Satan, and they are nothing to mess with, nor is that man (the "spell caster")! As for the "sneaky house "clean" method," I used to use that a lot when I was married decades ago; the m-i-l was a witch, a very mean woman who would literally white-glove oour tiny trailer house all the time if she saw the least hint of a mess anywhere. I finally got so fed up with her nastiness, plus working full-time in a city 35 miles from home--her precious son would not work, flat-out refused to work, nor would he take care of our son once he was born--so I did things like bagging dirty dishes and hiding them under the porch until she was gone. Laundry got hidden inside the washer and dryer until she was gone, or I would (ostensibly rudely) just go ahead and do the laundry--her son wouldn't do any of it--and do the dishes while she sat and ragged on and on about how she always maintained a "clean" house. She and dad-in-law were each 3 1/2 pack a day smokers, so figure out how clean their houses really were (NOT!). The comments about spell caster is complete spam. ...moving on...my pastor and his wife showed up with no notice and not only was the front hallway basically being used as a catch all for things going every which way, but we had thrown a movie on which we didn't know anything about and within thirty seconds of turning it on, hearing the f bomb like 6 times, in walks my pastor. Oh my goodness. It was quite a "dirty" house at that point. I'd much rather have him walk over laundry piles that hear that horrible language on our tv. My laundry room is just off the kitchen. If the washing machine and/or drier are empty, I've stashed things in there too! where did you get your couch!? i love it! My mom has a plastic ben under the kitchen sink that we put out dirty dishes in while the dish washer is full of clean dishes. She also takes all our laundry to the laundry mat when it gets out of hand. Thank you so much for being vulnerable and sharing your "real" home. I have chronic, daily pain that is invisible to others. People don't understand why I can't keep my house clean. It takes all of my energy to work full time, and take care of my two children (and two cats) as a single mom. I feel SO much better to know that I am not alone. Can you tell me where you bought your rug and curtains? I absolutely love this room! This is particularly hilarious to me because I implement about 90% of your tips already- my fave being the "hide it behind the couch" tip. I have the same couch and ottoman as you and also employ this tactic!! Your sofa is so lovely, we've had ours for about 9 years and it's seen better days. I did make a nice slipcover out of a drop cloth though so you'll never know! Thanks for the post- love it! EXCELENTE !!! ME HA ENCANTADO ESTE POST. SALUDOS DESDE URUGUAY!!! Tried and tested ideas! I use laundry baskets for those last minute mad grabs and everything goes into the basket. Floors get swept, bathrooms run through, and the most visible places dusted. Oh yes, because we live on a cattle ranch, the mudroom entry must must MUST be swept, organic matter on the floor does not a pleasant greeting make:) A few spices such as whole allspice, cinnamon sticks, and when available coffee beans that have gotten too old are thrown in a pot with some water and simmered on the stove on low heat. That takes care of unpleasant odors beautifully. Visitors will always pop in when something very odiferous such as bacon was cooked for breakfast:) Who wants to have their visitors leave smelling of bacon? Even if they did come to see just you. Anyway...thank you for your vulnerability and openness. It is truly refreshing. Great tips! Anyway I hope that the DH, who is the "culprit" of bringing people over the last minute, "at least" does half of the work, if not all! Usually if you turn the rug on your carpet the other direction, it will no longer move. It has something to do with how the weaves match up. Saw this on pinterest, love it!!! LOLed through this :) Thanks for the read! Thanks for journaling my regular "cleaning" routine! A long time ago there was a cleaning expert on a show, and he said "if you can't see it and it doesn't smell, don't clean it!" All words to live by!! LOL! 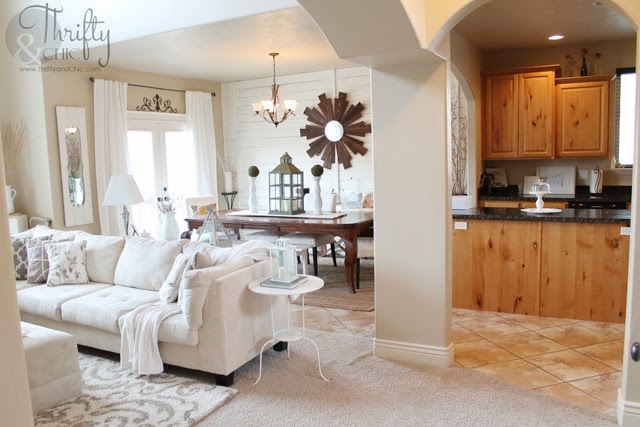 Great post, you have a beautiful home anyway! What I can't believe is that you do all that in 20 MINUTES!! What are you - a whirling dervish or something? I just make sure the hall, cloakroom and sitting room are looking OK as that's what most people see when they call unexpectedly. I often wish I hadn't got clear glass in the door from the hall to the kitchen (had to put it in as the hall was so dark otherwise). Maybe I'll get some 'glazing' effect stick-on stuff to put over it which will stop people seeing any mess but still let light in. Great blog though and it gave me a chuckle before bedtime!! With 3 teenage boys, 2 dogs, both of my in-laws and the hubby living in under one house -it's never clean. I work full time and I am the only person who cleans because no one else cares. So I so understand. Oh, I was going to say your house looks awesome. I keep the house deep clean, but it does get messy. So instead of stressing out before company pops in. We have what we call "company ready pick ups" 2 times a day. We stop what we are doing and pick up and put away in the correct places. The last pick up we do around 4 or so in the afternoon. House is tidy and we are ready for in drop ins. It works great. Baby wipes are wonderful to keep on hand to do quick clean with. They are great to clean window sills of dirt and bugs. They are great to run over the furniture for a quick dusting. They are great to clean ceiling fans with. Also great to wash the window screens with. Quick way to clean up spots and spills. Wash down the kitchen counters and cabinets. Wash up the bath room sink and potty area. It's nice to know that I'm not the only one who half hides and cleans when company is coming. I did pick up some good tips from you, though. Thanks for the fun read. These are great tips! Beautiful home. Can you tell me where your sectional is from? It cleans so nicely and its light colored with a dog on it. That is what I need! 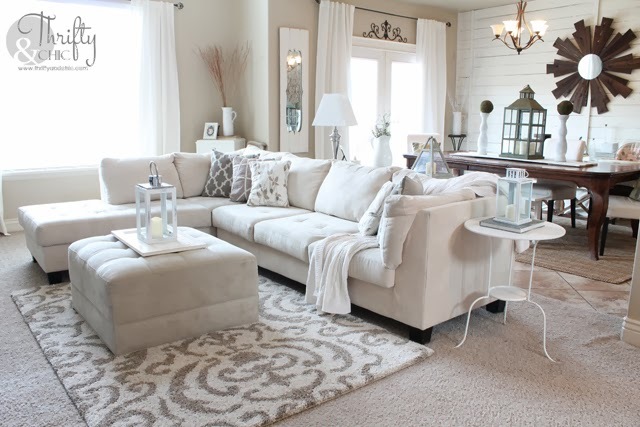 I buy reversible rugs and when company is coming or the rug starts to look grungy, I flip it over to the clean side. Makes a world of difference! Fantastic tips! I love this one for cleaning only few of the rooms. I am going to try it. Next weekend my mother in law will come and I will be prepared. Best regards! I had a friend who said, "Just make sure you clean whatever's in the bathroom that a woman can see when she's sitting down. Men don't care!" 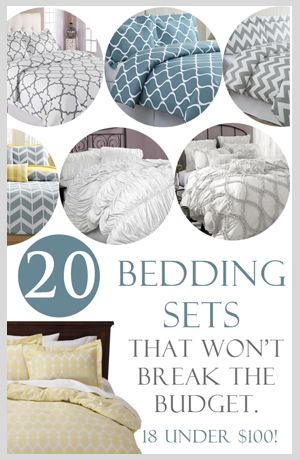 Have to add: invest in roller shades! After years of fighting the dust and dirt on slat wood shades, we changed to beautiful privacy lined roller shades. 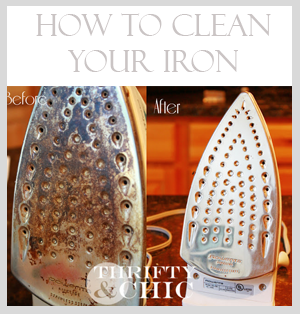 They are wonderful and so easy to clean! The slat woods always look dirty no matter how often one cleans them--and they are such a pain to clean. The roller shades look classy and are a breeze to clean. Living with Less~ really going through each room and really tossing. Purging the home makes the greatest difference. Less stuff to pick up, fold,and so on. My mom always taught me that each day make your home company ready. By living with less it is possible. You have a lovely home. 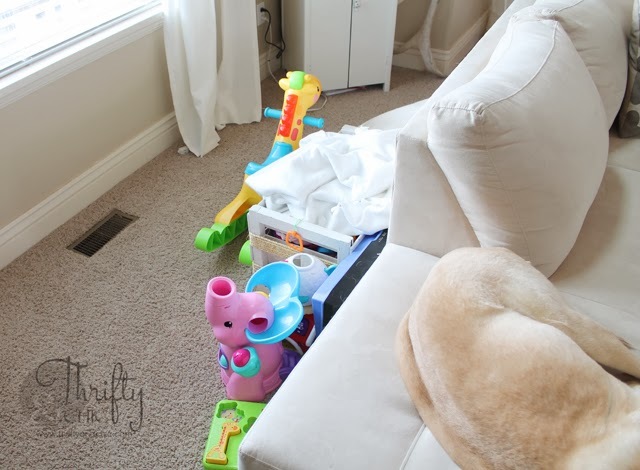 Ha, I like the toys behind the couch, and we have that exact step n play piano. My kitchen always has plastic dishes on the floor too, the baby likes to play in that cabinet. I leave it as a decoy so he doesn't get the breakable stuff. I learned a long time ago to designate specific areas for use to corral items for quick clean ups after way too many times of "I'll just put this here for now" and then, of course, forgetting what was where. I knew I only had to deal with those specific areas after outsiders were gone. I can say though that often when I finally got around to the totally forgotten "for now" stuff way down the road, as I looked through it (especially if it involved papers of any kind) most things no longer held the same importance to me and I could part with them oh, so much easier. Hi, I am so glad i read this, being a mom of a 2 year old and a 1 year old it helped me a lot. I now realize that i don't have feel bad about having a messy house bc the only reason it's messy is because we live in it. My kids scatter their toys everywhere and there might be a glass or something on the table where i ate lunch, I'm glad I'm not the only one who feels like i need to clean up even though it's just the little things. I have to be honest though, i actually pinned this bc i LOVE the way you decorated your living room and dining room. I actually pinned it under "wishful thinking" not even knowing what a great post was behind it. But I'm about to move to a new house pretty soon and I'll be able to get new furniture and i wanted to ask, where did you get your sectional? And what material is it? Also do you recommend a sectional or if you could do it again would you get a sofa and love seat? Thank you for the wonderful post! 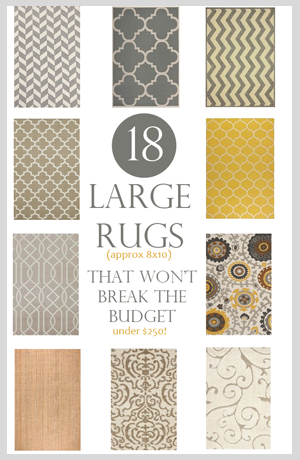 Hello, I actually was looking at this post and have been looking for a rug. I LOVE the rug you have in front of your couch. Could you please tell me where you purchased it? Hide the dirty dishes in th oven! Hands down best idea I've heard all day! I enjoyed this very much. Thanks for the tips!!! I like the idea of having a bin to throw things into and hide with a throw blanket!! Thanks for sharing. How AWESOME!!!! I'm sitting home with the flu-now on day 5-and searching for Farmhouse makeover ideas and Alicia...what a joy it has been to read your blog with you sharing your thrifty and chic farmhouse designs and seeing the wonderful transformations you've made since purchasing your lovely home. Your willingness to share the "TRUTH" about how life really is "behind the camera" is so refreshing to so many women. 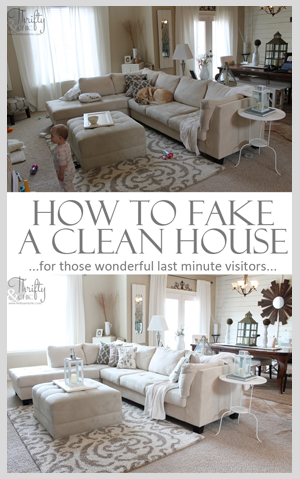 And your "How to Fake Clean Your House in 20 Minutes" tips are hilariously helpful when those last minute folks pop in! You are a breath of fresh air to so many working wives who are also mom's of active, messy little ones (and married to active messy hubbies too). My daughter works full time as an RN-14 hour days counting the 2 hours it takes traveling to and from work. She is currently going to school to earn her Bachelor's degree online when she's not working and then on to APRN school to earn her Master's Degree. My son-in-law is a wonderful hubs to my daughter and loving daddy to my granddaughter and is also daddy to his 4 year old daughter he only sees every other weekend from a previous marriage. And he puts up with me very well too, since I only live 2 streets over in the same neighborhood. He is a hardworking lineman-often working 16 hour days with power outages during bad weather-sometimes through the weekends too. I'm the proud grandmother of 2 girls - their 1 yr old daughter and I also consider myself as MIMI to his other daughter as well. I have the privilege of living close to them to help get my youngest granddaughter up and ready for daycare before I go to work myself-working 10 hour days. Mom and Dad leave at 5:30 am each day and don't get home until 7:30 pm. I read an earlier blog from someone who stated her MIL was bragging about how clean she kept her own home but was a chronic smoker.....LOL! I can only imagine how clean the MIL's home really is with 2 smokers in the house. :( My take on all this is - instead of any MIL pointing fingers at the daughter-in-law or judging them for not meeting the MIL's overwhelming expectations....jump in and help them out when you can! Sometimes women are married to men whose mother's did EVERYTHING for them and their husband's expect their wife to "do it all". I can attest that working wives and mothers are not superwomen. I am 58 years old and went through that time in my own life while working and raising children and trying to please everyone all the time by doing it all perfectly. It does NOT work! No human can keep up that pace. Burnout occurs to too many women who worry about what other's think. Your fake cleaning tips were WONDERFUL! I'd use many of these same tips many times over in my younger days - but the internet and sharing them didn't exsist like it does today. I for one am grateful that I can be a source of encouragement to my family. Instead of pointing my finger telling them what they should or should not be doing, I just help them keep the chaos to a minimum at times when I am there - before my granddaughter wakes up in the morning, I have 30-40 minutes of time to help them out! And when I drop in at times just to give my granddaughter a hug and a kiss or see her walking for the first time....instead of focusing on the mess.....i just love the ones who live in that home that mean so much and are bringing so much joy into my life as their grandmother, mother and mother-in-law! It's the relationships we build with people that matter most! It is NOT the cleanliness of the home that matters. I too love my home being beautifully decorated with thrift finds that have been creatively transformed with much love and hard work. 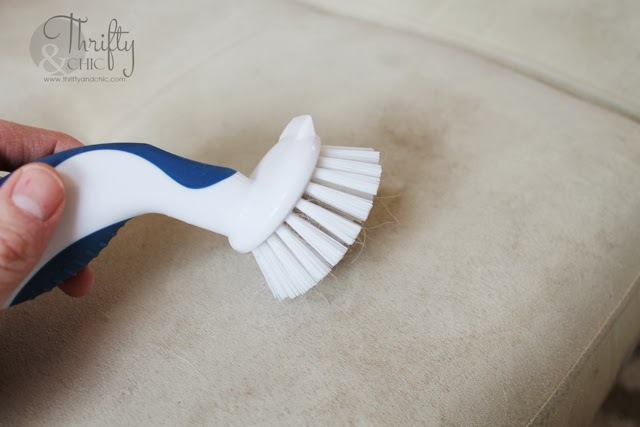 Your blog is so heart-warming and your willingness to share your dirty little secrets about housecleaning is very refreshing and helpful to so many young women. 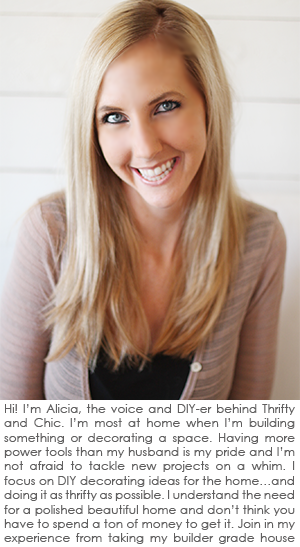 Keep up the good work and inspirational blog Alicia! May the Lord richly bless you and your family as you encourage so many others through your transparency and in sharing the transformation of your beautiful home as it evolves into the home you want it to be! I have a stencil above my window where my kitchen table sits that says, "The Fondest Memories are made when Gathered around the Table". 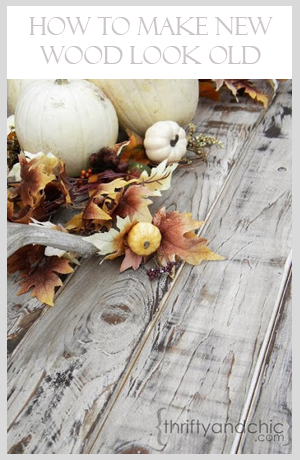 Thanks for allowing us to gather around your table through your blog!!! !